This article will highlight only some of the significant changes or functional differences within the Dossier Interface. For a breakdown of the changes in other Interfolio modules, please see our separate articles on Faculty180, Faculty Search, or Review, Promotion & Tenure. Some content in this article may only be relevant for Dossier Deliver and/or Dossier institution users and not Dossier free accounts. 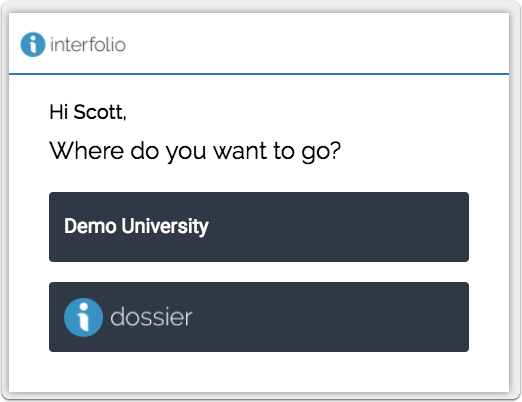 Coming in March, Interfolio Dossier will be undergoing a makeover. 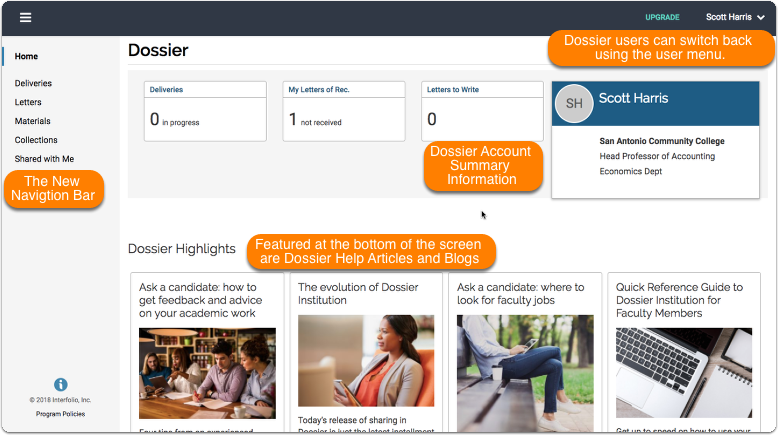 In short, all Dossier users will have their own homepage to work from to store and maintain their materials for job search, review, promotion, tenure, or other evaluation and activity reporting. We believe that this new experience will help users take advantage of every tool at their dispense. 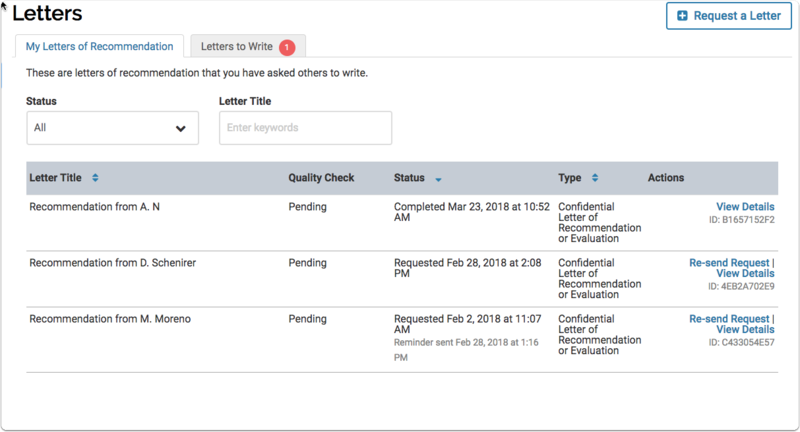 The Institutional Homepage [More than one can be featured] - Where Institutional users can access institutional processes through Interfolio, such as hiring for positions, review/promotion cases, or faculty activity reporting. If users are part of more than one, than more than one institution will display. Simply navigate to the User Menu in the top right corner to change to the other accounts. To switch the default, navigate to the Account Settings option within the User Menu. Logging in With Personal Credentials with an Account Associate with an Institution or Multiple Institutions. 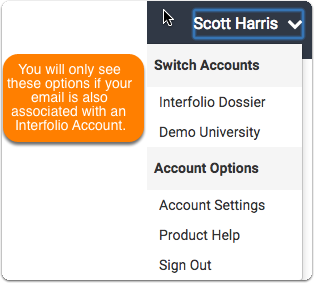 Users with an SSO enabled account, can authenticate using their own credentials, as set on their own personal Interfolio account of the same email address. Then they click “Continue” button, and are taken to the SSO authentication page for the account they selected, after succuessfully logging in, they can access institutional specific data. Access our Interfolio helpsite located here at product-help.interfolio.com. Easily switch to and from your institutional homepage and your personal Dossier. Only available if your email is also connected to an institutional Interfolio account. Materials that have been uploaded as part of a candidate packet, application to a position, or imported from Faculty180 will be available in the Materials section of your personal Dossier. Packet guidelines for candidates through the Review, Promotion & Tenure module will also display on this page. 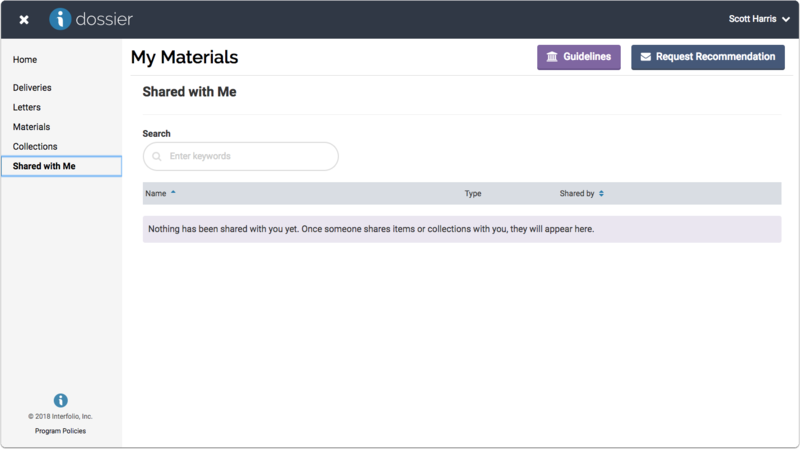 If a user has Dossier Deliver or Dossier Institution, they can share documents with other Interfolio users, you can find all of them easily with the "Shared with Me" tab if the user has requested your feedback. 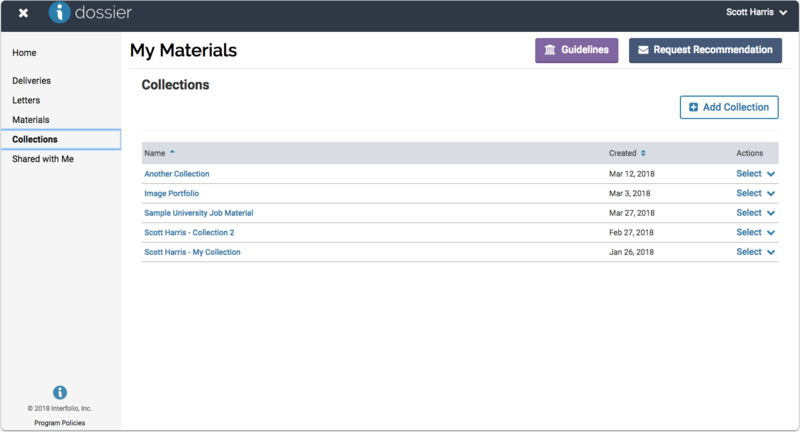 We have broken the collections page out of the materials page so you can easily access the materials in the organizations that you've created yourself and best understand. The letters page will contain all of the letters that have been written for you, as well as the letters that you have been asked to write. The quality check status displays in the table below.